I then challenged myself. I wanted to use the same embossing folder and card stock and create a masculine version of this card. Butterflies and cursive font tend to be more feminine, so I used the Hero Arts Alphabet die set and cut out the word "happy". 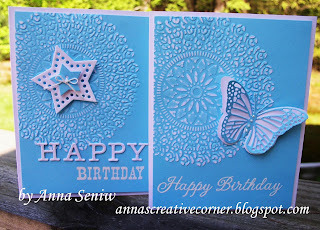 I then found a bold font for birthday (a Hero Arts stamp) and stamped and embossed it in white. I used a Nellie Snellen set of star dies and attached it to the card. Here are the two cards side by side. Now, this brings me to another class - His and Her Cards! You will create 3 sets of cards, one female version and male version, using either the same supplies, or same sketch, etc. 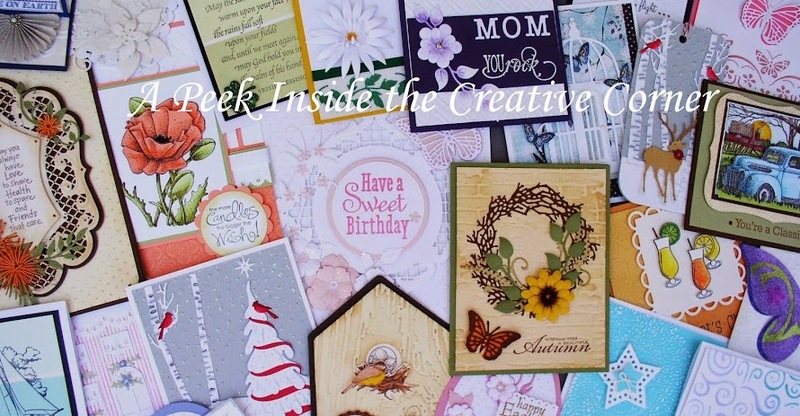 This will be a fun class with lots of tips for you to stretch your supplies and think outside the box. We always have a harder time creating a card for our male friends and this class will get you out of that rut! Join us on Thurs, May 30 at 1PM or on Saturday, June 22 at 11AM. Call and pre-register for the class and save $3. To Distress or Not - That is the Question!